Just e-mail me, and I might be able to help out. Of course, any additions, corrections etc. can also be e-mailed. * Most of the 'indigenous' Indian Army officers are not shown in the sources at my disposal, so can't add these on these pages. Note. Abbreviations and explanations can be found at the help page. Education: Warwick School; Pembroke College, Oxford (where he was studying jurisprudence until the outbreak of war). Government service in the Sudan Political Service, 1948-1953. Later he worked in a variety of companies in many countries. Education: a.t.o. (qualified on an Ammunition Technical Officer's course at the School of Ammunition, RAOC, Bramley). Son (with two brothers and two sisters) of Harold Francis John Banham (1866-1955), and Edith Alice Boulton (1876-1966). Education: Hamilton Technical College, Canada. Son (with seven sisters and five brothers) of Joseph Bardsley (1874-1932), and Agnes Wright (1879-1931). Honorary Colonel, 10th (Wiltshire) Battalion, Mobile Defence Corps. Assistant Surgeon 1st class (British Cadre) ? Son of Charles Edmund Barlow, and Teresa Helen Deakin, of Anglesey, Wales and New York, USA. Elder son (with a twin brother and one brother who died in infancy) of Harold Barlow (1860-), and Millicent Alice Peacock (1873-), of Bengal, India. Burma Forestry Commission under Messrs. Bros. & Co Ltd. (Myitkyina). Son of Lt.Col. Stuart Barnes, OBE, Royal Artillery, and Kathleen Mary G. Whittard. Married ((09? ).1948, Winchester district, Hampshire) ... Newman. Son of Maj. Louis Harding Barnes (1865?-), and Anne Chinner Barlow (1867-). Education: Haileybury (2nd term 1921-2nd term 1924). Worked for Lloyds Bank, 1925-1929. From 1929 with Borneo Co., Bangkok, Siam. * Recommendation for the appointment to the OBE for Lt.Col. S.D. Barnes: Throughout the above period [15 May to 14 Aug 1944] Lt. Colonel Barnes work as ADOS [Assistant Director of Ordnance Services] Headquarters Fourteenth Army has been of an exceptionally high order. He has during the DDOS [Deputy Director of Ordnance Services] frequent absences on tour been responsible for giving many quick and important decisions on Ordnance matters and it is largely due to his exceptionally clear thinking, hard work, and all round knowledge of Ordnance that it has been possible to ensure an adequate supply of Ordnance stores and ammunition to operational troops. MRCVS. Late Colonel Commandant, Royal Army Veterinary Corps. Married (02.1946, Brentford district, Middlesex) Joyce I. Fleet; .. children (one daughter?). 1914? Son of ... Barry, and ... Norris. His son writes: "My father was initially RCT, injured at Dunkirk and subsequently commissioned in RIASC. 2LT (1942) Capt (1945) later Maj.". Education: National University of Ireland (MB, BCh, BAO 1936). Son of Lt.Col. Thomas Adam Anderson Barstow, Seaforth Highlanders, and Jane Cape Barstow. Married (1927) Nancy Lewkenor, of Cocking, Sussex, daughter of late Brig.Gen. Henry Lewkenor Knight, CMG, DSO. His brother, Brigadier John A. Barstow, MC, also died on service. Married; two sons, one daughter. Son of Henry Battams, and Henrietta Maria Haas. Commander Ulster Defence Regiment, 1973-1976. Son (with two brothers and two sisters) of Stafford Stratton Baxter (1874-1939), and Alice Bessy Ray Buckle (1877-1945). Son of John H.G. Bayles, and Florence V. Heaton (née Powell). OBE | IGS clasp NWF 1936-37 | 39-45 Star | Burma Star | 39-45 War Medal | 39-45 India Service Medal | Nigeria Independence Medal 1960. Five cased boxing medals named to him 3 for the Imperial Services Competitions 1930-31-33 and 2 for Sandhurst against RAF Cranwell 1934-35 all winners medals at various weights. Kings Badge and certificate for those disabled due to service, 2 sets of WW11 Para wings. Education: jssc, psc. Son of Harry Whiffing Beamiss (1865-1944), and Kate Stephens. Education: Marlborough College, Wiltshire; Royal Military College, Sandhurst (1912-1913; Sword of Honour). Married Gwendoline Mary ...; two sons. ? Son (with one brother and one sister) of John William Beaumont (1883-1952), and Elizabeth Pattrick (1891-1976). Manager in the construction trade. Son of John Bell (1874-), and Ethel Richmond (1896-1994). Son of Godfrey Bennett, and Louisa Wills. Second son of Harold Berridge, CIE, OBE, of Sutton, Surrey. Married 1st (27.09.1934) Patricia Gwendoline Berry Castleman-Smith; one son, one daughter. Education: Dover College; Royal Military College, Sandhurst. Passed out from Sandhurst, shipped to Bombay in Oct 1941. Joined Poona Horse Division. Learned about tank technology. Sent to Egypt under Col. Hatch (3rd Indian Motor Brigade), later Col. Kilkelly. Was involved in a Stukker raid in Alexandria in 1942, injured and sent to Cairo hospital. Rejoined his regiment in Damascus a few months later. Spent some time in Cyprus. Returned home in 1947. Son of Lt.Col. R.F.S. Beyts. Married 1st (1940) Ruby Elliott (died 1980); one son, one daughter. Married 2nd (1981) Linda Segrave Daly. Education: Bowden House School, Seaford; Wellington College (1921-1926); Royal Military College, Sandhurst (1926-1928); Staff College (psc). Son of Lt.Col. Gordon Travers Birdwood (1867-1945), and Alice Caroline Finlay. Married Diana V. Turner; one son, one daughter. Son (with two sisters and two brothers) of Levi Birks (1873-1950), and Lucy Barlow (1880-). Married 1st (29.04.1918, Ardwick, St Matthew, Lancashire) Elizabeth Harris (1898 - 1976); two sons, one daughter. Married 2nd Bertha ... (? - 17.09.1941). Son (with one sister) of Joseph Birtwistle (1894-1965), and Isabella Standing (1895-1969). * For conspicuous gallantry valid ability in action on 8th and 9th August, 1918, E. of Amiens. The section of Tanks under his command did excellent work and reduced numerous enemy points of resistance, capturing or destroying many guns and machine guns. After Tanks of his own and other sections had been put out of action near Rosieres by direct hits, he went round the disabled Tanks under heavy fire, noting their position and condition, and seeing to the evacuation of the wounded. He also brought back valuable information as to the situation on the flanks. He behaved splendidly throughout. Participated in the 1920 Olympic games on the 4x100 m.
Son of Alexander Forrester Brown Blackater (1860-1925), and Mary Jane Nimmo (1873-1925). Published: Gods without reason (1948; war memoirs). Brother of Capt. Norman Arthur Blaquiere. Brother of Maj. John Arthur Blaquiere. Formerly of Dehra Dun, India. Fourth child of Frederick William Bodeker, and Katherine Louise Thompson (?-1898). His father remarried and had four more children. Fought for the 1st Burma Division. In his letters to his wife, who had fled to Dehra Dun in India, he described his war time experiences. He was second-in-command to the “Brig” and to “Marsh”. He also did some Intelligence work. As a trained Forestry Officer, working for the family Timber Company in Moulmein, he brought an invaluable understanding of jungle warfare with him. After the order to withdraw from Maymyo, he with a band of others walked out on the Burma Trail to India in 28 days, arriving in Shillong in May 1942, before the Monsoons [which were very bad that year] arrived. Later, he was based in Hoshiapur in India. In Western Australia, he stood for Parliament for the DLP [Democratic Labor Party] against the sitting member, Paul Hasluck, who later became the Governor General of Australia. Bodeker gained 12% of the vote, which was seen as a recognition of his personal skills and knowledge - as well as a swing against the Liberal Party. Literature: C.M.T. Nash (ed. ), W.B.T. Bodeker – 100th anniversary (1996). Son of William Bone, and Georgina Budgen. Worked with British American Tobacco pre- & post-war. Formerly a rubber planter and manager, at Travancore, India. Son of James Edward Borrell (1897-1975), and Hulda Briggs. Architect, town planner and painter. Lived in Great Britain, USA and New Zealand. Son (with one sister and one brother) of Charles John Boulter (1874-1963), and Isabella Woods (1884-1969). Brother of Lt.Col. Henry George Victor Boulter, Indian Army. Married (02.11.1949, St George's Garrison Church, Singapore) Elizabeth Maureen Gray Robins (21.05.1924 - 21.07.2011); one daughter, four sons. Education: Imperial Service College ("B" House; 01.1932-07.1936; School Prefect; House Captain; 1st IX; 1st XV; Sgt., Officers Training Corps); Royal Military College, Sandhurst (1936-1937); Staff College (psc). Education: Royal Military College, Sandhurst (1928-1929). Son of Tom Lake Bowden, and Marjorie Harnet Stack. * For brave conduct on the 14th July 1958, when the British Embassy in Baghdad was attacked by an armed mob. On this and the following days he maintained communications between Her Majesty's Ambassador and the members of his staff. Education: BA; Staff College (psc). Son (with two brothers and one sister) of John Bagenal Boyd (1855-1935), and Dora Knox-Fletcher (1876-1956). Married (12.07.1948, Poole district, Dorset) Johanna Wilhelmina Geerlachdina Dijkslag (06.05.1914 - 17.04.2010), earlier married (with one son) to Cornelis van Kan (1921-1970), and daughter of Capt. Frederik Dijkslag; one son. Education: St Columba's College, Dublin; Royal Military College, Sandhurst (1936-1937). Horse breeder (he was buried on 09.04.2006, just before Numbersixvalverde, bred by him, won the Grand National). Married Marjorie "Bill" (née ...) (died aged 87 27.12.2006, Whitford, Devon). Son (with one brother) of Ernest John Egerton Boys (1887-1953), and Janet Myfanwy Thoresby Jones (1892-1990). His daughter writes: "He trained with the Royal Scots, transferred to the Indian Army. Was at OTS Mhow (1941-2); served in India, Iraq and Egypt (as Lt), returned Bombay March 1945 and served in India, Burma and Malaysia. Transferred back to British Army." Son (with four sisters) of Cuthbert David Bozman (1861-1943), and Ellen Mary Todhunter (1869-1951). Education: MB, ChB (Edin) 1924, DPH (Lond). Director of Public Health, Burma. Health Adviser to the British Middle East Office at Cairo, 1950. Curator, Wellcome Museum of Medical Science, 1956-1964. A relative writes: "I believe started in a Calcutta Scotch volunteer regiment, subsequently merged with the Indian Army Ordnance Corps. Taken PoW in either Africa or Italy, to Camp 29, Veano (Piacenza). He was reported to his parents as missing believed dead; however, on being released from Veano he made his way independently to Switzerland." Son of James Hudson Brereton (1869-), and Mary Paton Schorr (1878-1916). Published: Russian tanks 1915-1968 (1970); The 7th Queen's Own Hussars (Famous regiments series) (1975); The horse in war (1976); A history of the 4th/7th Royal Dragoon Guards and their predecessors, 1685-1980 (1982); A guide to the regiments and corps of the British Army : on the regular establishment (1985); The British soldier : a social history from 1661 to the present day (1986); A history of the Royal Regiment of Wales (24th/41st Foot) and its predecessors, 1689-1989 (1989); The history of the Duke of Wellington’s Regiment (West Riding),1702-1992 (1993; with A.C.S. Savory). Son of late Henry Edwin Briggs, and Georgina Martha Briggs, of Birstwith Hall, Ripley, Yorkshire. Married 2nd (1940) Irene Mona Wood, of Broadstone, Dorset, daughter of Herbert Henry Capper, of Colombo, Ceylon, and widow of Eng.Cdr. Alfred Oswald Wood, RN; one son. US citizen until naturalization in 1914. Married (04.1939) Margaret Mary Cox, widow of Capt. Peter Shannon, Indian Medical Service. From Castlerea, Co. Roscommon, Ireland. 1904 ? Solicitor. Prominent (international) golfer in Ireland during the 1920’s and 30’s. Son (with one brother) of Francis Ernest Brittain (1897-), and Dorothy Grace Sinclair (1900-1991). * Recommendation for the award of an immediate Military Cross to T/Maj. F.A. Brock: "At BAVAGNA on 16 June  during the advance to FOLIGNO this officer was commanding the leading squadron. Though obstructed by many demolitions and opposed by German rearguards, Maj. Brock by his skillful handling of the squadron pressed forward, killing and capturing a considerable number of the enemy. As a result of this rapid advance several extremely valuable bridges were saved, on more than one of which the German engineers were surprised and driven off when in the act of blowing the charges. Continuing the advance N.E. from BAVAGNA the squadron captured a horse drawn battery, destroyed a large quantity of equipment and inflicted further heavy casualties. Throughout the day Maj. Brock showed great initiative and drive. His gallant leadership under fire was an inspiration to his men and his determination to overcome all obstacles is worthy of the highest praise." Son (with one sister) of Capt. Walter Malcolm Brodie (1873-1958), and Elizabeth Ann Hughes (1889-1977), of Bristol, Gloucestershire. Education: Royal Military College, Sandhurst. Youngest son (with three brothers) of Julius Henry Bronnert (1871-1943), and Gertrude Emmeline Boon (1871-). Education: Manchester Grammar School (1925-1926); Manchester Tech (Master, Technical Science, Textiles, 1931). Son of Percy Arthur Brooke, and Elsie Read. Son (with one brother and one sister)of William Brookes, and Ellen Nutton. Married 1st ((09? ).1939, Sheffield district, West Riding of Yorkshire) Mary Wilson. Son of Albert Edwin John Holmshaw Brown (1892-1938), and Effie Gladys Burrell (1890-). Son (with one sister) of James Francis Leadley Brown (1874-1955), and Edith Charlotte Hubback (1876-1947), of Kokstad, Cape Province, South Africa. Education: Govan Secondary School; Glasgow University (22.04.1940, MB, ChB). Practised as a General Practitioner in Glasgow from 1946 to 1962. Emigrated to Cape Town, South Africa. Son of George Harkness Buchanan. Married ....; two daughters, one son. ? Son of Lt.Col. Cecil Henry Buck, Indian Army, and Eleanor May Buck, of Yateley, Hampshire. Husband of Celia Buck (née Wardle), of Yateley. Son of Alfred Eustace Buckley (?-1938), and Lizzie Towne (1885-1963). This eulogy for Maj. H.H. Buckley was written by his son Chris: "Harry first became involved in Militarism in 1936 at Cambridge University, where he joined the Officer Training Corps. He was studying Mechanical Engineering and Mathematics, so naturally joined an engineer unit. After University He worked for Mather and Platt, an engineering company in Manchester and was in a Territorial Army engineer unit as a reservist. With the dark clouds of war on the horizon he was fully mobilized before the outbreak of war in 1939 and deployed to France with the British Expeditionary Force as an Engineering officer. 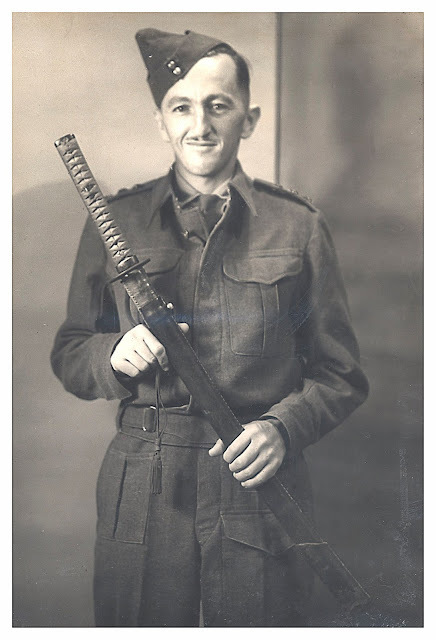 It was in France that he met his future wife Margaret who was in the Auxiliary Territorial Service and was deployed to France as a ’passive air defence instructor’. Prior to deployment she had held the rank of Corporal but had had to relinquish it to private for deployment purposes. The stories of their meeting are entirely from my mother and can be related on another occasion. I attempted to engage my father on numerous occasions with questions like ’Tell us a story from the war’. He was always reticent and sometimes counter attacked with grizzly descriptions, to try and silence my questions. He would relate that war involved long periods of boredom. From my mother I learnt that he, alongside her, were posted to a factory where maintenance was carried out on the tanks. On one occasion intelligence had determined that the factory was vulnerable to German bombing, so my father organised the demolition by explosives of the factory chimney to make it less recognizable from the air. Strategic Withdrawal was the main action for this army and as a child I gleaned from my father that an army in retreat was not a picnic. He related that there were people being shot for lacking discipline in retreat. Relating this story to an ex British Army regular he said - in the first war yes, but not in the second world war. All I can do is relate what I heard him say. As an engineer he was in the rear party in retreat, blowing up bridges and other installations to slow the advancing Germans. They retreated to St Nazaire where Harry was again ordered to stay back to fill up the harbour with the abandoned vehicles used in the retreat. He was the last to leave and left the port on a motorcycle. He had been given money and was able to pay for passage to the UK on a fishing boat. The fisherman were suspicious that they would be impounded if they put into a port, so they landed Harry on an isolated beach. Upon return to the UK Harry discovered that his new love’s family lived in a large house. The story goes that he joined the British Indian army as the pay was better and would enable him to afford his unfolding future. It is my belief that in the retreat many of Harry’s unit members were lost, probably on the Lancastria, a troopship sunk in St Nazaire bay with the loss of approximately 4000. The army realized that he would be of greater use in the far east than in a re-hash with the Germans. He sailed for India and became established with the British Indian Army in Rawlpindi. He was then posted to staff college in Quetta, Pakistan. Before boarding the train he was instructed to phone HQ at each stop as the situation was deteriorating. He never arrived to start the course and instead was deployed to Malaya to command a unit of the Royal Indian Army Ordinance Corps - primarily staffed by Indian troops. He was in the jungle to face up to the advancing Japanese army. Comments gleaned from my mother were that he learnt to feel safer during the night - ‘the only time he ever felt safe’; and that there were problems with communications. This latter information has been well documented in analysis of the reasons why Singapore fell. With the fall of Singapore Harry passed the next three and a half years as a prisoner of war in Changi POW camp. My father was an excellent Bridge player. The story I was brought up on, was that he made up a bridge foursome together with the senior British officer, and that this officer did not want to break up the bridge foursome - so my father was not sent to work on the Burma - Siam railway. ‘He played bridge to save his life’. A more realistic explanation I think is that he was not sent to work on the railway because he was an only son of a widowed mother. My father explained to me that it was the task of the senior British officer of the camp to select people to meet the demand for workers on the railway. The casualty rate on the railway was much higher than in the camp. The Japanese worked people to death - similar to the German concentration camps. For the first year of captivity, officers were not required to do manual work. After that he was put to work digging and growing potatoes. Apparently this helped him survive as some of the more lenient guards would allow them to eat the roots, which are of course similarly nutritious to a potato. He would have been severely disciplined for taking a potato. Also during captivity he traded his watch with a guard for some ducks. Enterprise is necessary to survive the POW experience. On liberation he was returned to India and apparently reunited with his non-field kit. Upon return to the United Kingdom he was admitted to the royal naval hospital in Greenwich to recover from a large boil caused by years of malnutrition He was also suffering from the after-effects of Malaria. While in hospital he learnt watch repair as a hobby, a form of therapy. He was demobilized from the army and moved forwards with life working as an engineer, marriage and raising children. He died in 1975 at the age of 58. He worked a full working life up until he was given a year off for medical reasons six weeks prior to his death. It is believed that his demise at a fairly young age was partly caused by consequences of his wartime service. I also believe that he worked fully to the last in large part because that is what his fallen comrades had done in the Japanese POW camps, and it was his way of maintaining solidarity. 25 years after his death my mother was given a lump sum by the British Government as compensation. Survivors are annoyed that the Japanese government has not paid compensation, has not admitted responsibility of any kind, or offered any apology. Harry now has a grandson named Harry." Son of William Buncher, and Rose Ward. Son of William John and Emily Florence Burge. Married 1st ..., an Indian citizen; no children. Awarded the Indian Service Medal and Indian Independance Medal, presumably also the 1939-45 Star and 1939-1945 War Medal. Held the British War Medal 1914-1918 from WW1. Had 12 medals in all; 1937 Coronation Medal (as Secretary at Sanawar School); others possibly IGSM x2 and jubilee? His son writes: "My father was at the battle of Kohima, and he told me when he was alive that he organised the tank onto the tennis court during the battle. This was a turning point during the battle by all accounts. He was originally an officer in the Assam Riffles, and later became an officer in the 1st Gurkha Rifles reaching the rank of a retired Major." Son of Dr Arthur H. Burnett, and Ellen L. Bryant. Married 1st ...; two sons, one daughter. Lieutenant-Colonel Burnett moved about his area energetically and fearlessly by land rover on rough tracks and by helicopter. He frequently faced the danger of ambush by an ubiquitous enemy and on occasions personally took charge of the situation under enemy fire. During the months January and February his troops accounted for 93 enemy intruders. As a result of Lieutenant-Colonel Burnett's efforts the dangerous situation threatening Tawau was overcome, the extremely low morale of the local people was restored and the large local Indonesian population was deterred from causing serious trouble. It was chiefly due to his energetic determination, fearlessness and fine leadership in the field that a large and dangerous enemy incursion was defeated. Education: Kelly College, Tavistock. Colonel, 10th Princess Mary's Own Gurkha Rifles, 01.03.1975-01.03.1977. Managing Director, Tehran Racing. Son of Herbert J. Burt, and Gertrude M. Wenn. Third son of Alfred George Butler, and Beatrice Anne Butler, of Blackheath. Second son (with four brothers and one sister) of Canon John Whitestone Butler (1869-1953), and Edith Mary Burnett (1880-1949), of Thomastown Rectory, Kilkenny, Eire. Married 1st (1945, Lucknow, India) Eileen Mirembe Weatherhead (02.1921 - 1949), youngest daughter of Canon Herbert Thomas Candy Weatherhead (1875-1930), of C.M.S., Uganda, and Edith Eileen Barton; one son. Married 2nd Lawrie Armel Yearwood (16.01.1930 - 03.6.1994), daughter of W. Armel Yearwood, and Agnes Bayne; ... children. Education: King's Hospital, Dublin & Trinity College, Dublin (BA 1938, MB, ChB, BAO (Dubl, 1940)); Diploma in Tropical Medicine & Hygiene (Eng, 1950). Medical Officer, Tanganyika, 1947. Medical Officer in Mahenge, Tanganyika, 1952-1961. Provincial Medical Officer at Morogoro, Tanganyika, 1961-12.1963. Served with the Kenyan Government, 1965-1969. He worked in Natal, South Africa, 1970-1990. Younger son of James William Butterworth, and Mary Esther Fitton. Son of David William Byrne (1892-1974), and Victoria May Terry (1897-1950).